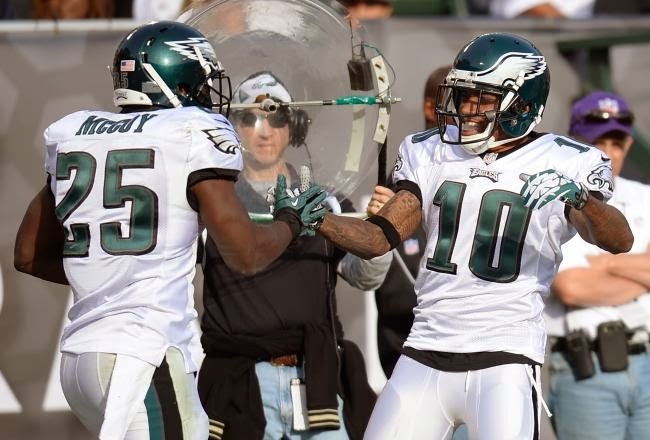 The Eagles' offense has to be smiling about facing a depleted Saints defense in Philly. Yesterday, we previewed the AFC half of Wild Card Weekend - today, the NFC half. We aren't going to bother with an intro like we did yesterday, let's just get straight to the games. Philadelphia's rushing attack gets the lion's share of the attention, and deservedly so - their 2566 yards on the ground and 5.1 yards per rush both led the league by sizeable margins, and their DVOA score (+23.7%) had such a large lead over the rest of the field that the 2nd-best rush offense by that metric (Kansas City - +12.3%) was actually closer to league average than they were to first. And yet, if not for DeSean Jackson, Philadelphia might not have even made the playoffs. Most people focus mostly on how well Philadelphia attacks the middle of the field with their zone-read runs and stick routes to their tight ends and slot receivers (Jason Avant, Brent Celek, and Zach Ertz combined for 106 receptions for 1418 yards this year), but many lose sight of the fact that it's DeSean Jackson's presence on the outside that de-clutters the middle of the field and makes all that action possible. If Philadelphia's outside receivers were as inept as say, Oakland's, or St. Louis', defenses would be able to bottle up the Eagles' run game because Rod Streater and Chris Givens aren't exactly inflicting the fear of God into opposing secondaries. But because Jackson is so dangerous in space (particularly on the packaged-in bubble screens that seem to accompany most zone-read plays), defenses are forced to commit more resources to the outside, creating numbers advantages inside the box for the run game. At that point, Philadelphia can just play hat-on-hat and usually end up with LeSean McCoy one-on-one in space against a linebacker (or Nick Foles vs. Air), a matchup that the Eagles will usually win. So if McCoy is the engine that makes the Eagles go, you could say that Jackson is the oil that helps the engine run smoothly. The Saints have plenty of firepower on offense, and Cameron Jordan has emerged as a star up front for their defense, but you need to keep an eye on Harper's play, especially because the guy he's replacing changed everything for New Orleans this year. Rookie safety Kenny Vaccaro did just about everything for the Saints' defense. He played both free and strong safety, occasionally lined up in the slot as a Nickel corner, and was a force coming into the box for run support. He has ranked in the top-2 of the team in tackles, passes defended and forced fumbles since moving into the starting lineup in week two, and has the look of a budding "do-it-all" star. But Vaccaro broke his ankle in New Orleans' critical week 16 tilt with the Panthers, and so savvy vet Roman Harper has been inserted back into the lineup. Harper started for the Saints last year, and was solid as a strong safety, playing the run and short passes well, but he lacks Vaccaro's range and game-changing abilities down the field. There's a reason, after all, that the rookie out of Texas supplanted Harper for the starting job. Whether or not the Eagles are able to take advantage of Vaccaro's absence remains to be seen, but you know Chip Kelly and his staff are aware an impact player is missing from the New Orleans secondary. Yes the Eagles run the ball as well as anybody. Yes, Nick Foles has been a revelation at quarterback, and yes, DeSean Jackson keeps opposing coordinators up at night as if they lived on Elm Street. None of that would matter if Philly's defense was as bad as it was to start the season. The Eagles began the year 1-3, giving up an average of 35 points and over 440 yards per game to opposing offenses. Since then, Philly has surrendered more than 22 points in a game only once (A weird blowout loss to Minnesota), and are allowing just 20 points a game (17.8 if you factor out the Minnesota outlier). They've also forced turnovers in all 12 games since the terrible start, with multiple turnovers in nine of them. How has this happened? Well, installing a new system takes time. When Chip Kelly and his staff changed the Eagles defense from the disaster that was the "Wide-9" 4-3 run during Philly's "Dream Team" season, it was about finding which personnel could fit where in a 3-4. Deadspin ran an article that, I think, made the Eagles' 3-4 sound a bit more revolutionary than it is. But, they are right that it is not a traditional 3-4, in the sense that there isn't one massive nose tackle and a bunch of attacking athletes. The Eagles usually line up as a 3-4, but use a similar defense to Will Muschamp and the Florida Gators, and some principles of "two-gapping" popularized by Bill Belichick and the Patriots in recent years. Borrowing from both schemes, they employ many 4-3 principles up front, and rely on the versatility of a few players at multiple spots. For instance, second-year defensive lineman Fletcher Cox, formerly an athletic DT, has become a force as a hybrid tackle/end, while Trent Cole has re-branded himself as a hybrid DE/OLB, or the "Buck" as it's called in most hybrid systems. The point is, there are a lot of moving parts, a ton of speed and interchangeable players in this defense. Hell, it's confusing to write about, so you know it's tough for opposing quarterbacks to decipher at the line of scrimmage. The Saints' foibles on the road have been covered extensively in this space and others, but it's a trend that bears repeating. In their eight home games this year, they were roughly equivalent to the 2007 Patriots on steroids. A near-unstoppable offense with an elite defense to boot. On the road, however, they were roughly equivalent to the 2007 Bills - a team that can barely get out of their own way. Earlier this week, Chase Stuart of the New York Times brought to light a rather troubling statistic for anyone backing the Saints this weekend - teams that play their home games indoors are 3-22 when playing outdoors in the playoffs in cold weather (defined here as 35 degrees or below). After a large storm system dumped nearly two feet of snow on the northeast on Thursday and Friday, with a cold front expected to slide in behind it, and an 8:10 kickoff time, it doesn't seem likely at all that the weather will favor New Orleans (as of this writing, weather.com predicts that it will be 21 degrees at kickoff in Philadelphia with a 20% chance of precipitation). I suppose you could argue that Philadelphia's offense, also based on timing, pace, and a propensity to create big plays, could be hampered by poor weather. But we have seen them play in inclement weather - a week 14 rout of Detroit in a driving snowstorm. They gained 478 yards in a foot of snow. I'm not sure it will be an issue. I think the "New Orleans on the road" thing is real - especially taking into consideration the numbers presented by Chase Stuart. On top of that, New Orleans will be without safety Kenny Vaccaro, the one player from their secondary that they just couldn't afford to lose. Replacing him will be Roman Harper, who is more often than not completely overmatched in pass coverage. With how often the Eagles run stick routes down the seam of the field, it should prove to be a real problem for the Saints. It will likely be a shootout, and if New Orleans can't get their offense going outdoors, it will be curtains. Give me Chip Kelly, Nick Foles, several Seans (De and Le) and a play making defense against the beaten up and freezing Saints. Like Jeremy said, New Orleans seems to be a completely different team on the road and, barring a super human effort from Drew Brees, just don't look like they can match the Eagles score for score outside in the cold. I'm really going out on a limb here, but I think Green Bay plays better when their two best offensive players are in the lineup. Shocking, I know, but try to stay with me. Cobb was only on the field for maybe two dozen snaps in Green Bay's Week 17 win over Chicago, but he was able to come up with maybe the two biggest plays of the game - both of his receptions went for touchdowns, including the 48-yard strike on a do-or-die 4th down late in the game. It was Cobb's first game since fracturing his tibia in October against the Ravens, but he was still able to be a difference-maker. The return of Rodgers was the one more apparent when watching the Packers' offense. Obviously, he's better than Matt Flynn, Scott Tolzien, and Seneca Wallace, but the degree to which he is, is staggering. The throws that he's able to make, and the plays that he's able to make on the move (like stepping around an un-blocked Julius Peppers to launch the touchdown throw to Cobb) transform the Packers from an above-average offense to an elite offense, but more on this later. The 49ers have been on a tear lately, and they've done it without a fully healthy Mike Iupati. The All Pro guard missed four games with a knee injury, and has been back for San Francisco's last two games, but looks far from his usual self. That was evident last week against Arizona, where Iupati failed to get to the second level against the Cardinal's athletic linebackers, and the Niner run game suffered. If San Francisco is to run the ball effectively in the frigid conditions of Green Bay, Iupati will have to play better than he has since coming back. As mentioned above, the Packers are two completely different teams based on their quarterback. Yes, Green Bay is the only team in the playoffs with a negative scoring margin. Yes, they finished just 21st in the league in total DVOA, behind a number of NFC teams that didn't make the playoffs, like Arizona, Chicago, Dallas, Detroit, and St. Louis. But half of the season came without their all-world quarterback. In Rodgers' eight full games, the Packers were 6-2. Without him, they were 2-5-1. Both of those wins came by a single point. With Rodgers, the Packers' offense averaged 30.7 points. Without him, they averaged 21.5 points. With Rodgers, the offense averaged 443 yards. Without him, they averaged 357 yards. So judging the Packers based on their full season isn't giving them a fair shake. They're a much better team now than they were a month ago. The one positive that came out of Rodgers' absence was the development of the running game. Without Rodgers, the offense had to lean on Eddie Lacy and James Starks more, and the Packers actually finished the season ranked 7th in rushing yards and 4th in yards per attempt - two categories in which they've finished no better than 20th in any of the previous three seasons. Hidden Points: Cracks in the Niner Secondary? San Francisco has, by any metric, one of the best defenses in football. The Niners are third in scoring D, 5th in total D, 4th in rush D and 7th in pass D.
Heading into week 16, San Francisco had only surrendered 400 yards in a game ONCE all season. Then they gave up 400 in back-to-back weeks, allowing the struggling Falcons and defensive-minded Cardinals to look like the '84 Dolphins and '07 Patriots, respectively. Ok, it wasn't that bad, but giving up 399 passing yards to Carson Palmer doesn't exactly inspire confidence when you have to face Aaron Rodgers in a win or go home scenario. Again, the Niners D is great, but perhaps not as great against the pass as it was earlier in the year. The 49ers have won six straight games leading up to the postseason, which is certainly nothing to sneeze at, especially considering one of those wins came over Seattle and another came on the road against a very good (and criminally underrated) Arizona team. However, I think Green Bay has the upper hand in this matchup in a very similar way to how San Francisco did last season. Last year, San Francisco used a savvy strategy in that they stopped running zone-read offense late in the regular season before unleashing it again in the playoffs. That way, Green Bay wasn't expecting to see it in their playoff game because the 49ers hadn't shown it over the last few weeks of the season - Green Bay just didn't have it on tape and were completely flummoxed by it when the 49ers started running it. I think something similar could happen this year, but to Green Bay's benefit. Because Rodgers has been out of the lineup and only recently returned (and the same can be said to a lesser extent for Randall Cobb), San Francisco may have a tough time keying in on Green Bay's tendencies. They only know how Green Bay attacked Chicago's defense, but they won't have a very good idea of how they'll attack San Francisco's defense, because there's no recent tape that would give them any indication. It could lead to a situation where San Francisco is forced to play a rather vanilla defense to start the game, because they don't want to guess and be wrong. And if Green Bay can open up an early lead, it could lead to serious problems for a San Francisco offense that very quietly has been terrible throwing the ball - they had 11 games this season with under 200 passing yards. If Green Bay can take an early lead and force San Francisco to take to the air, the 49ers might not be able to come back. Every time these two teams play, I think "this is the time Aaron Rodgers and Co. figure out that Niners defense," and they never do. Well, I'm not falling for that again. San Francisco's D has looked slightly human lately, but they always seem to beat up Packer receivers before they can get off the line, and I have a feeling Willis, Bowman and those Niner linebackers will have a little something extra for Eddie Lacy. On offense, I don't know how they will score points, but Jim Harbaugh found a way to score 23 on Arizona's great defense (While only rushing for 83 yards), so I have to assume he'll be able to do a little better against Green Bay. Plus, and I feel like everybody is sneezing at this (Even if they say they aren't), but the Niners are the proverbial "hot team." They've won six in a row, with victories over Seattle, St. Louis and Arizona in that span. If the last decade has taught us anything, it's that you don't win the Super Bowl when you're at your best, you win it when you peak at the right time (See 2004 vs 2005 Steelers, 2008 vs 2007 Giants, 2006 vs 2012 Ravens). Last year the Niners were probably the best team in the league, but now they're the hottest.